New technology gives us the power to manipulate the human genome. Should we use it? A young couple sits in a lavish designer office, flipping through catalogues and hemming and hawing over the latest styles and features. She is a radiant young woman with exquisite cheekbones and flashing eyes. He is a tall, muscular fellow with wavy hair and a flawless smile. As they bicker over color choices, they could be picking out a living room set or a new minivan. But in fact they are shopping for the attributes they would like to give their firstborn child—a son or daughter who will join them in the ranks of a new race of designer humans. This is not a scene from a science-fiction film. It’s a scene from our future, according to stem-cell researcher Paul Knoepfler ’89. His new book, GMO Sapiens: The Life-Changing Science of Designer Babies, explores the history of genetically modified organisms, our capacity to apply this technology to people, and the ethical questions surrounding both. The CRISPR system was created by cleverly hijacking a part of the immune system found in bacteria that evolved to identify and destroy genes belonging to viruses that attack these bacteria. This process has been understood for decades, but the real innovation came in 2012, when a team of researchers figured out a relatively quick and easy way to reprogram these bacterial molecules to pinpoint, delete, and even rewrite any gene in any living thing. A CRISPR CUT: click above to see the details of the CRISPR system. Reprinted with permission of The Scientist. illustration originally appeared in article from march 1, 2014. Knoepfler knows what he’s talking about. 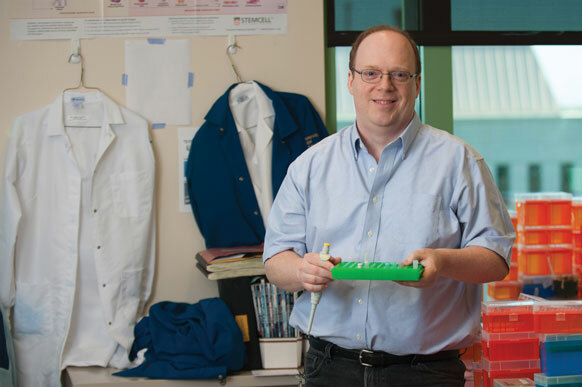 An associate professor at the UC-Davis, he is on the front lines of cancer research. He is also devoted to public outreach. He wrote a book about stem cell research and maintains an influential blog devoted to the field. Despite receiving some pushback from other members of the scientific community, he believes it is urgent that the lay public discuss and debate the issues of how science, medicine, and society should intersect. CRISPR is a case in point. Although the technology represents a substantial improvement in precision and power over previous genetic editing systems, it still makes mistakes. For instance, CRISPR may go to work at the wrong place in the genome. Even if it finds the gene it was designed to target, it may make the wrong correction. And, yes, you can put your hand down, Dr. Ian Malcolm, there is the fact that the genome is an incredibly complex and intertwined network that remains imperfectly understood. Even if CRISPR does exactly what it was designed to do, the potential for setting off unforeseen genetic consequences is substantial. And any mistakes would be inheritable, making the disaster a transgenerational one. Knoepfler points out that the negative publicity after an accident could create a backlash that could set back any useful therapies by decades. He cites the tumultuous history of gene therapy, a genetic technique that has been used to treat children with X–linked severe combined immune deficiency (the so-called “bubble babies”). At first, the treatment seemed successful in clinical trials, restoring the immune function of children suffering from this life-threatening disease. But then five of the children later developed leukemia, and one of them died. While gene therapy has come a long way since then, the public remains understandably skeptical. In addition to worrying about the consequences of failure, however, he worries about the consequences of success. What will happen to society when a select group of people—presumably privileged and affluent—can design their children to be smarter, healthier, faster, more athletic, and better looking? Will this lead to the dystopian nightmare of Aldous Huxley’s Brave New World? After Reed, he taught at a school for kids with learning differences for several years before obtaining a PhD in molecular pathology from UC-San Diego. From 2001 to 2006, he was a research fellow at Fred Hutchinson Cancer Research Center in Seattle, and he is now assistant professor in the department of cell biology and human anatomy at UC Davis School of Medicine and assistant investigator and member at the Institute for Pediatric Regenerative Medicine, Shriners Hospitals for Children, Northern California. His wife, Anca Anastasescu Knoepfler ’90, is a physician in the UC Davis Medical Group, and their daughter, Aliana Knoepfler ’17, is a psych major at Reed. His book has attracted praise from other researchers. “Paul Knoepfler manages to convey the excitement and potential of genetic engineering without sounding like Pollyanna, and compassionate concern over its misuse without sounding like Chicken Little—a highwire act that is all the more virtuosic for its seeming effortlessness,” writes medical historian Nathaniel Comfort. “The book takes us on an engaging roller-coaster ride through the new genetics, which could greatly impact many economic, policy, and personal decisions in the next few years,” writes CRISPR pioneer George Church. But his most significant accomplishment may be to help us understand that these issues are not fundamentally questions of science but questions of ethics—and that the responsibility of facing them belongs to all of us.